One of the mixed blessings of living across the hall is the constant reminder of the down-hill slide of aging. The reminders come in many forms. It makes me tired just watching daughter Kate and son-in-law Marton chase after two active wee ones while working or dealing with graduate school, all with too little sleep. I did it, but couldn’t possibly manage it anymore. 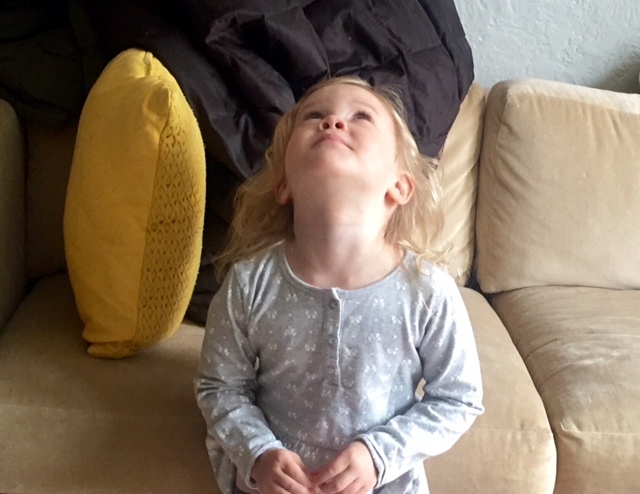 Then there’s three-year-old Leila who is so at home in her body. She is athletic and adventuresome, graceful and confident. What a contrast to my awareness of the need to be careful going up and down stairs. And she has questions: “Amma, what’s that?” pointing to a wrinkle or a varicose vein on my leg. So why would I call it a mixed blessing rather than just a curse? Probably because I sense there is some gift in all of this loss of stamina, all these signs of an aging body. Last summer Bill and I took a landscape photography class in Donegal, Ireland. We were taken to countless old wrecks, some all the way ashore, some still in water. At first I didn’t get it. Why would we want to take pictures of these beat up old things? I had completely forgotten about that stage of toddlerhood when “why?” becomes the most important question. And so on into infinity. I often wonder if the word “why” means the same thing to her as it means to adults. If you Google “why do toddlers ask why?” you’ll find some answers. But mostly you’ll find advice about how to handle the frustration of constantly being asked questions you can’t always find answers for. The site I found most informative suggests that toddlers aren’t as interested in cause and effect as we are. Rather, they want to know more about a subject and have discovered the power of that little word to keep an adult talking about it. They’re also learning about and practicing conversational give and take. Maybe all of this is fueled by wonder – that sense of looking around outside of oneself, marveling at what’s there, and wanting to know more about it. Two other friends, Mark and Jutta Brayne, have taken Ernst’s two-wheeler notion to a whole other level: An 1,800 mile ride on a bicycle built for two — from the top of New Zealand’s northern island to the bottom of the southern one — in part to raise money for freelance journalists who encounter trouble (or worse) on the job. After pedaling on their own for nearly six weeks, Mark and Jutta were joined for the journey’s final few days by their daughter, Katie, and her partner, Mela. Katie and Mela covered the same ground (and then some) but the advantage of individual bikes (and younger legs) made for fewer days on the road. We were taken with this Brayne family adventure for all sorts of reasons. I first encountered Mark and his bike 35 years ago in Vienna, where he cycled to work at the old Bankgasse press center where we occupied side-by-side offices. Although in sporadic touch over the years, it wasn’t until last summer — during our final days at Beacon Hill Friends House — that the four of us re-connected in person. Mark and Jutta were visiting the U.S. from their home in Sheringham, on England’s east coast, and there was a lot to catch up on. I’m just back from spending two weeks in California teaching in a prison. The prisoners with whom I work are learning to become addiction treatment counselors. Many of them are lifers, doing time for murder. Of necessity, they have to do their own recovery and rehabilitation work in order to become effective counselors. It’s a long hard road for them. As we shared our plans to move in across the hall from Kate and Marton and the kids, one of the frequent reactions went like this: Uh-oh, lots of baby-sitting in your future! Fair enough. Mention grandparents living nearby and baby-sitting is a blessing or curse that comes naturally to mind. But in the six months we’ve been living across the hall so far, I can count the instances of what I’d consider baby-sitting — supervising the kids while the parents head off for other pursuits — on a single hand. Our alone time with the kids seems less like baby-sitting and more like hanging out. Mateo tends to hang out in the mornings, Leila after dinner. Mornings work like this: As the early riser on our side of the hall, I decide when Apartment #4 is open for business with Apartment #3. When the time comes, I hang the OPEN side outside our door. If Mateo has also awakened early, Marton or Kate take occasional peeks across the hall to see if the sign is up. If it is, Mateo makes his entrance. Coming up on ten months and 31 pounds, he’s a big guy whose mobility has not yet progressed to the stage of crawling that involves his belly leaving the floor. He’s a contented kid, usually as comfortable playing with toys on a blanket in the middle of the living room as he is twirling around in his exersaucer. But we like to start the mornings in my lap. Maybe like most people, I’ve always been a little lost when it comes to communicating with babies. Baby talk feels too cute; normal talk seems inappropriate in its own way. With Mateo, I let him take the lead. His lack of words doesn’t appear to concern him one bit. He’s got his moves: gaze, grab and bite, all supplemented with his repertoire of grunts, squeals and raspberries. How many miles from Mom? The typical American lives within just 18 miles of his or her mom, according to a recent study by the University of Michigan, with 40 percent living within five miles. That news hits home for us this week, with our kids (and their families and significant other) under one roof (if you include the roof across the hall) for several days between Christmas and New Year’s. This happens for us just once a year, and it’s a good occasion to reflect on the role of geography in the way we’ve lived our lives. When Carol and I got married in 1970, we were pretty open about where we might live. We did rule out at least a couple of places: Florida and California. Funny how we ended up spending about a decade in each state. We were each encouraged by our parents, especially our mothers, to seek our dreams wherever they took us. In Carol’s case, that meant living near home (Louisville, Ky.) for the last time at age 17, when she went off to college. Same with me, living in Groton, Ct. for the last time at age 18. In retrospect, it’s clear I was never very intentional about the role of geography in my life. I’d never even visited Detroit when a Free Press alum in the New York Times Washington bureau (where I was an intern in 1971) set me up with my next job. Our next several moves were also the result of opportunities more presented than sought (in Washington, D.C., central Europe, Detroit (again), Silicon Valley and Florida). We considered opportunities to live closer to my folks in Connecticut only a couple of times — Boston in 1975 and New York 20 years later — but neither job worked out and we ended up staying put in Michigan and California.